Choose from thousands of spaces in London - including on-street parking, off-street car parks and thousands of reservable spaces. Finding and accessing most areas of the UK’s capital city by car is relatively straightforward (at least until you’re in the heart of the bustling centre), with the M25 encircling and linking Greater London to the rest of the country. However, high volumes of traffic and high demand for space in the city centre can result in a challenging parking experience. Greater London consists of 33 borough councils, each charging different rates for on-street parking – so be sure to check your destined area’s tariffs before you park up. It is also worth noting that London has a daily Congestion Charge in a clearly defined zone of Central London, costing £11.50 per day. This, coupled with London’s very convenient integrated transport system, should both be factors you consider when planning any trip by car. More information on London’s Congestion Charge can be found on the Transport for London website. 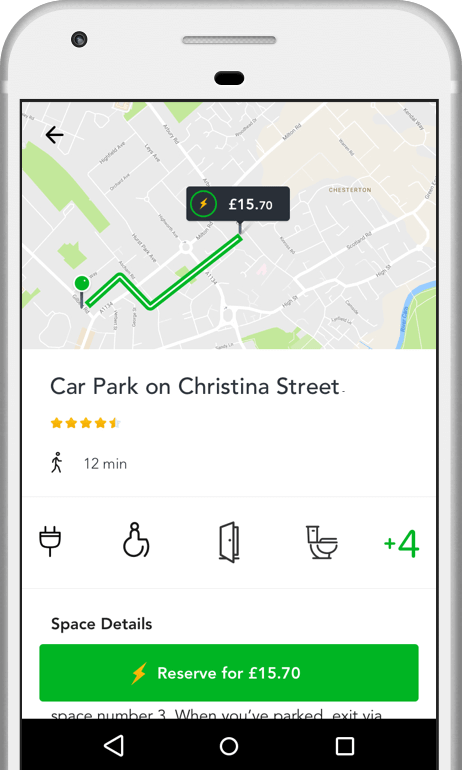 JustPark provides information on 1,000s of parking options across London – both on-street and off-street, from private driveways to car parks – many of which are reservable. Depending on the location, prices can vary significantly when it comes to on-street parking within London. In regards to the more expensive city centre parking, there are a number of options – but all usually have limited spaces available. Paid parking bays in Central London can set you back as much as £4.90 per hour in places such as Soho or Hyde Park, but you can save substantially by parking a little less centrally – Regent’s Park, for example, has fares as low as £2.40. On-street pay-and-display parking generally operates between 8:30am and 6:30pm in London. However, be aware that each borough council will have their own terms and tariffs. You can browse on-street parking spaces across London, and see what’s available during your visit, via the JustPark map. Off-street car parks in London can be incredibly expensive, with some charging £50 per day. That being said, NCP are a good off-street option, with over 100 car parks in London that operate 24 hours per day. They generally provide a cheaper option than other privately-run car parks, and are often better value than on-street parking too. Some of these car parks start at around £25/ day, but the ones more central can be just as pricey as the most expensive options. JustPark offer thousands of reservable off-street spaces across the city, in both public and private car parks – with plenty to choose from in popular areas such as Shoreditch, Southwark and Brixton. You can browse these options and book a guaranteed space via our website or app. London’s public transport is unrivalled in the UK – with fantastic overground, underground and bus links making all of Greater London very accessible on one easy integrated system (meaning travelcards and tickets can be used across the various transport types). When visiting inside the Congestion Charge Zone, it may be worth considering parking just a few stops outside of the central areas – using public transport to complete the rest of your journey, which can save you time and money. Disabled parking is widely available throughout the city and can be found at many of London’s most popular attractions. The Blue Badge Scheme enables holders to park in disabled spaces that can be found at London Zoo, almost all city museums, and at tourist destinations further afield such as Kew Gardens. Blue Badge holders are also entitled to exemption from London’s Congestion Charge – to attain this, you will need to apply through the Transport for London website. You can also filter when searching on JustPark to show all our London parking spaces which have disabled access (select this option by clicking on ‘Filters’ on the search results page). London’s many stadiums and arenas usually have event-specific tariffs in the surrounding areas, making on-street parking difficult on these days. It’s worth keeping up with the schedule of any nearby stadiums and other one-off major events (such as the London Marathon), as these will undoubtedly affect your parking options throughout the year. Some spaces are reserved solely for Resident Permit and Blue Badge holders, so be careful not to park in these illegally. However, all options shown on the JustPark map can be parked in as normal – we’ll only show you spaces which are not restricted during your required times. Many pay-and-display spaces are free to park in overnight as long as you depart before tariffs start (which can be as early as 6am, so be careful!). Many car parks do offer overnight tariffs, but NCP’s 24-hour car parks are probably the most affordable solution in London. Most councils offer free pay-and-display parking on Sundays. In some boroughs, such as Kensington and Chelsea, pay-and-display spaces are also free on Bank Holidays – but other councils will still charge on all days due to limited spaces. To see what’s available overnight, enter your dates and times on our search results page. There is so much to see and do in London – from spying the city from the London Eye, to exploring history in the Tower of London. You can marvel at the grandiose Buckingham Palace, or simply absorb the atmosphere of a thriving city from Leicester Square. And with a wealth of ways to get around, parking and transport woes shouldn’t have to be a part of any day in the UK’s capital city.